Construction Administrator takes charge of various administrative duties in the company’s construction projects. 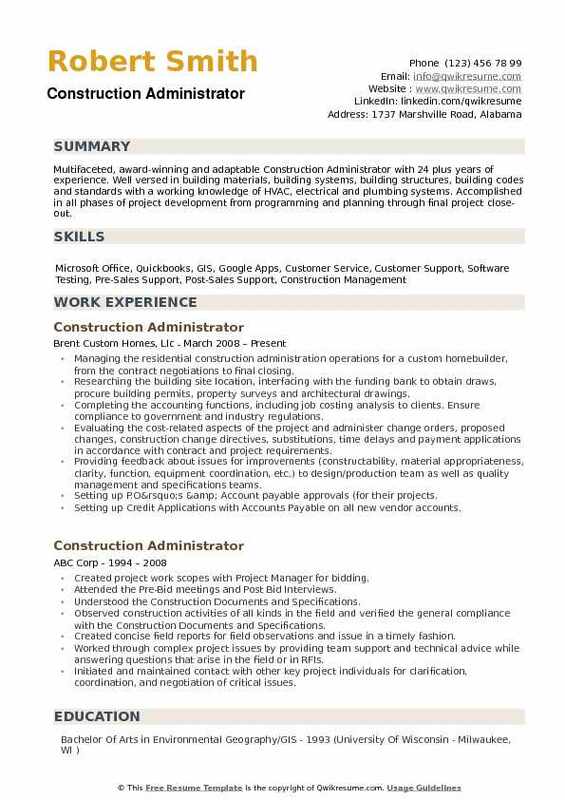 The job description and duties listed on the Construction Administrator Resume include – ensuring delivery of materials on time, calculating construction costs, understanding project specs and architectural documentation, assisting in construction process, performing on-site inspections, monitoring and tracking construction progress, creating scheduling timelines and cost estimates and maintaining an accurate record of construction supplies and equipment. 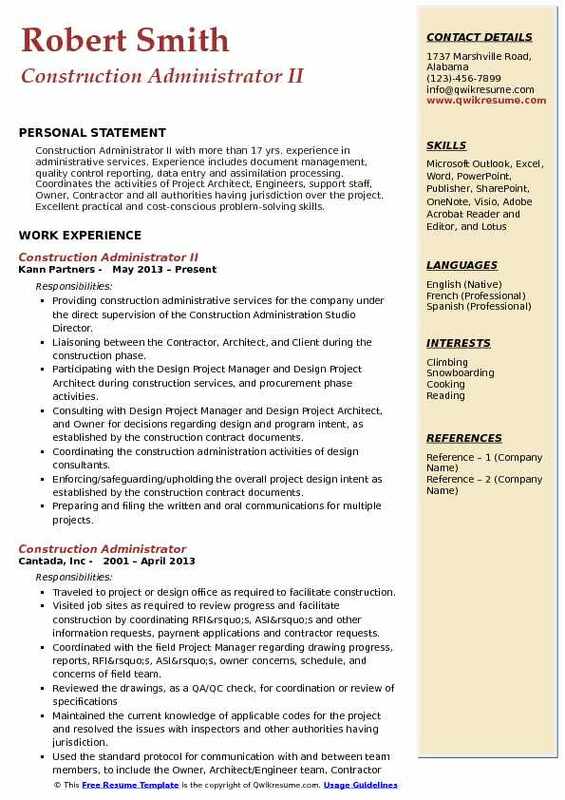 A Bachelor’s degree in Civil or Architectural Engineering is required for this designation, prior work experience is as well needed. Possessing an industry and engineering certification will be advantageous. Candidates applying for this role should be well organized, and be able to perform the administrative tasks with utmost efficiency under minimal supervision. Solid knowledge of industry related rules and regulations and the ability to adapt to the same are as well mandatory for this post. 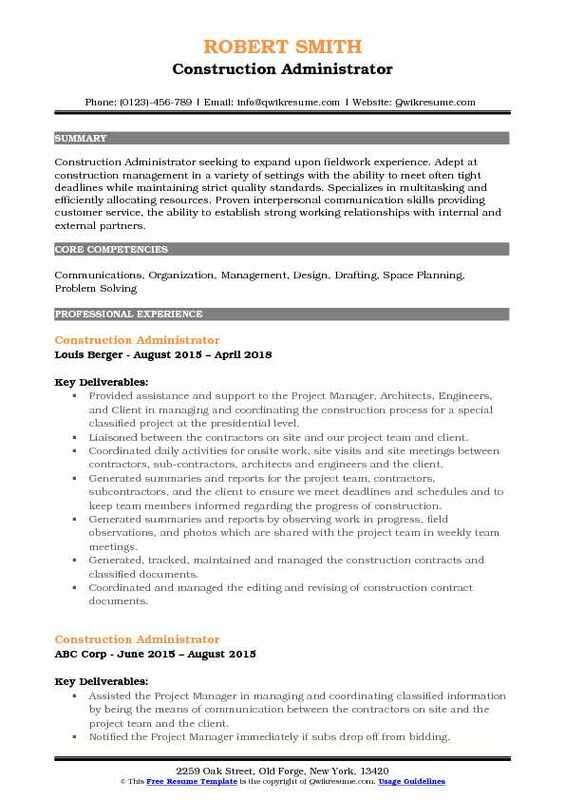 Summary : Dynamic, positive, and solutions-oriented Construction Administration professional with valuable experience of 22 years in pre-construction management, budgeting, cost control, and contractor coordination. Successfully moved from QuickBooks for contractors and implemented computerized accounting and project management software. Created and facilitated reporting and analysis that evaluate system/Technicians performance. Identified issues, analyzed available data and recommended the changes to management. Provided analytical support of actual results. Created and maintained compliance reports that identify discrepancies within the billing systems. Communicated with the MSO on the performance data and follows up with any corrections. Helped coach the management on identifying week performers and taking corrective actions. Ensured the accuracy of the date through a partnership with MSO, Team members and day to day validation. Ensured spot checking/auditing is done to ensure data integrity. Monitored financial progress of projects and communicated with the Project Manager as required. Summary : Seasoned Senior Construction Administrator versed in all aspects of construction administration. Responsible for subcontract management, pay applications and miscellaneous invoices, lien waivers, insurance certificates, start-up and close-out of projects, and much more. Valuable experience working with vendors and suppliers to negotiate optimal pricing, along with securing contractors and negotiating contracts. Worked closely with the Manager Of Construction and to complete the procurement, construction and commissioning work for Heroes Elementary School. Implemented the C.H.P.S. Program for high-performance design and construction obtaining an additional $350,000 in state funds by using 30% recycled materials throughout the buildings. Managed, monitored and controlled the scope, schedule and budget in order to ensure project success and deliver the project on time and within budget. Processed payment requests, RFIs, change orders, submittals, correspondences, emails while keeping key stakeholders informed of the construction progress. Prepared and issued punch lists and closed-out checklist based on the specifications for extra-stock materials, keys, certificates, warranties etc. in the operation and maintenance binders submitted with the as-built drawings. Prepared and distributed a budget and schedule reconciliation report to the school board members including weekly construction photographs. Objective : Junior Construction Administrator with healthcare, commercial, hospitality, and multi-family housing project experience. Team leader with a proven record of creating effective relationships and client satisfaction. Dedicated, loyal, and focused, I am able to complete multiple tasks to achieve project goals. Excellent interpersonal skills and a clear and logical communicator that allows me to establish solid relationships with both clients and colleagues across all levels. Liaisoning between PE, PMS, and Subcontractors for all project administrative matters. Assisting the Project Executives and Managers to problem solve subcontractor invoices issues. Maintaining the internal electronic and paper filing compliance under the regulations. Overseeing the construction accounting procedures and make changes as needed. Improving the internal process of generating POs and change orders with vendors and subcontractors. Managing all incoming vendor and subcontractor invoices for Project Managers to approve. Processing POs, change orders, invoices, expense reimbursement to the accounting system. Preparing GL entries for month-end close and review financials with the Finance Manager. Communicating with payroll company for all payroll matters, such as onboarding new. Employees, federal and state filing, set up different states employees profile, and etc. 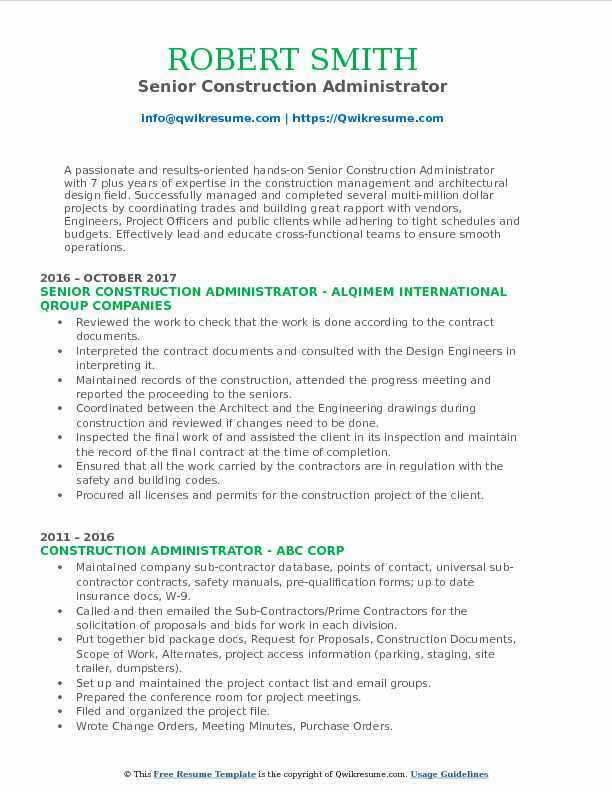 Summary : Licensed Construction Administrator I with extensive experience of 11 years in the project set-up, design and construction and remodel construction techniques. Strong knowledge in project management, an organization with experience leading project from pre-construction budgeting/schedule stage thru procurement, shop drawing/coordination development, construction, space turnover and contract closeout. Developed strong rapport with Contractors and Owners to ensure clear communication and completion of the construction contract. Reviewed documents for quality control to protect architect and client interest. Scheduled, led and recorded on-site pre-construction meetings, weekly onsite owner/contractor meetings, onsite project inspection /closeout meetings and any necessary building department/agency approval meetings. Inspected rough in work (mechanical, plumbing and electrical) to ensure proper installation and rough in dimensions. Initiated required field changes for conformance to contract documents, protection of architect and client, and cost control for unforeseen field conditions. Reviewed contractor required submittals for conformance to the construction contract, maintained a log and recorded the review. Worked with local building departments, California Division of State Architect and other governing authorities for project construction and code approval. 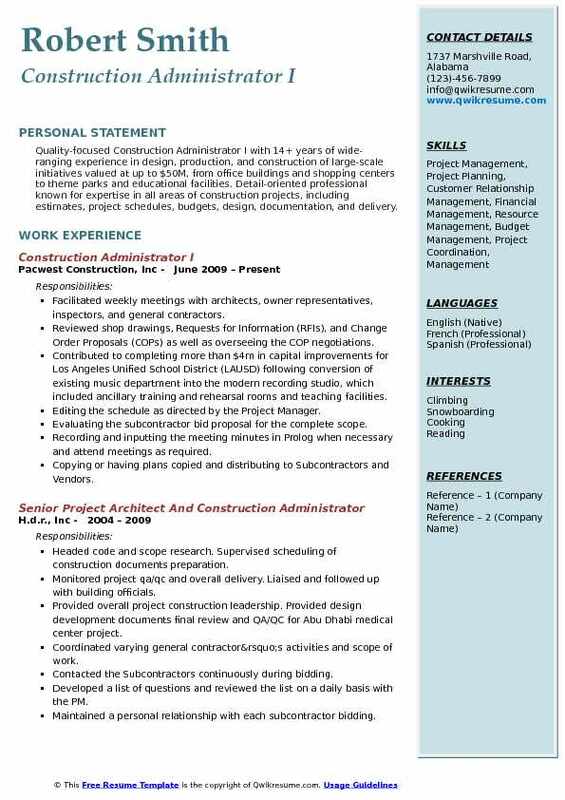 Summary : Quality-focused Construction Administrator I with 14+ years of wide-ranging experience in design, production, and construction of large-scale initiatives valued at up to $50M, from office buildings and shopping centers to theme parks and educational facilities. Detail-oriented professional known for expertise in all areas of construction projects, including estimates, project schedules, budgets, design, documentation, and delivery. Facilitated weekly meetings with architects, owner representatives, inspectors, and general contractors. Reviewed shop drawings, Requests for Information (RFIs), and Change Order Proposals (COPs) as well as overseeing the COP negotiations. Contributed to completing more than $4m in capital improvements for Los Angeles Unified School District (LAUSD) following conversion of existing music department into the modern recording studio, which included ancillary training and rehearsal rooms and teaching facilities. Editing the schedule as directed by the Project Manager. Evaluating the subcontractor bid proposal for the complete scope. Recording and inputting the meeting minutes in Prolog when necessary and attend meetings as required. Copying or having plans copied and distributing to Subcontractors and Vendors. 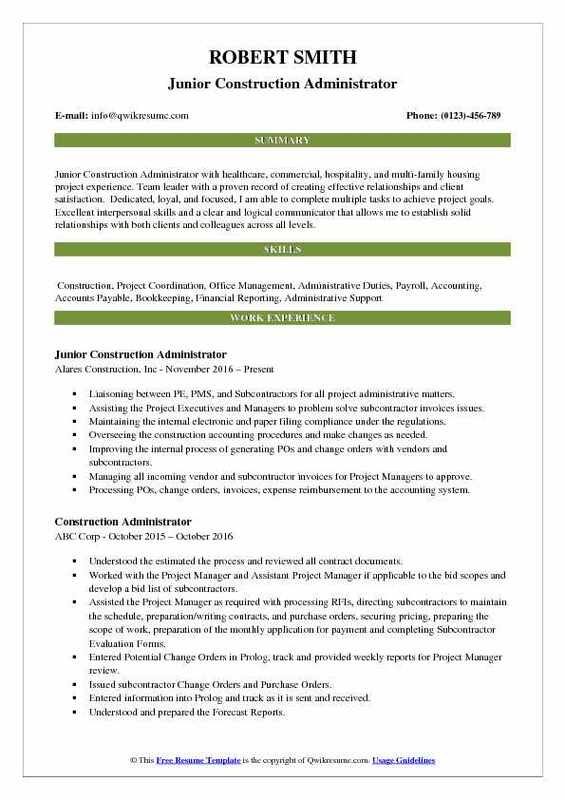 Objective : Jr. Construction Administrator experienced in the fields of architecture, facilities and construction seeking an opportunity in the architecture/construction field as an assistant project manager/assistant construction manager. Possess a record of planning and executing multimillion-dollar projects within strict time, budget, and quality constraints. Knowledgeable of relevant code/regulations as well as LEED requirements. 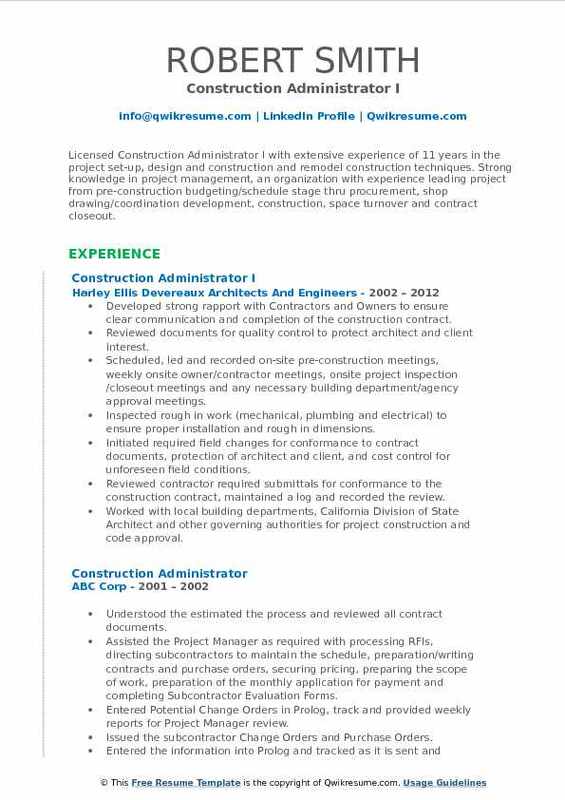 Providing specialized and complex administrative and project support for the developer construction team in the areas of contract, construction, and financial administration, documenting the control and data/file management. Responsible for tracking reviewing project billing and budgets, contracts change orders that exceed $150 million dollars. Securing and sending the documents (AIA G702, contracts change orders) to Architects, GCs and Owner for review and approvals via Docusign, email or obtain a wet signature. Preparing and tracking the contracts and change orders, securing approvals via Docusign, email or hardcopy. Resolving any contract/change order related issues. Handling construction related activity such as prepare bid materials, access general contractors and vendors database systems to download and/or review or retrieve project documentation. Interfacing with all individuals (internal and external) as needed to provide or receive information. Attending the monthly pencil draw and budget meetings, process vendor invoices payment applications. Running the routine job cost reports, entering, editing or deleting the contract budgets and budget revisions in Yardi. Summary : A passionate and results-oriented hands-on Senior Construction Administrator with 7 plus years of expertise in the construction management and architectural design field. Successfully managed and completed several multi-million dollar projects by coordinating trades and building great rapport with vendors, Engineers, Project Officers and public clients while adhering to tight schedules and budgets. Effectively lead and educate cross-functional teams to ensure smooth operations. Reviewed the work to check that the work is done according to the contract documents. Interpreted the contract documents and consulted with the Design Engineers in interpreting it. Maintained records of the construction, attended the progress meeting and reported the proceeding to the seniors. Coordinated between the Architect and the Engineering drawings during construction and reviewed if changes need to be done. Inspected the final work of and assisted the client in its inspection and maintain the record of the final contract at the time of completion. Ensured that all the work carried by the contractors are in regulation with the safety and building codes. Procured all licenses and permits for the construction project of the client. 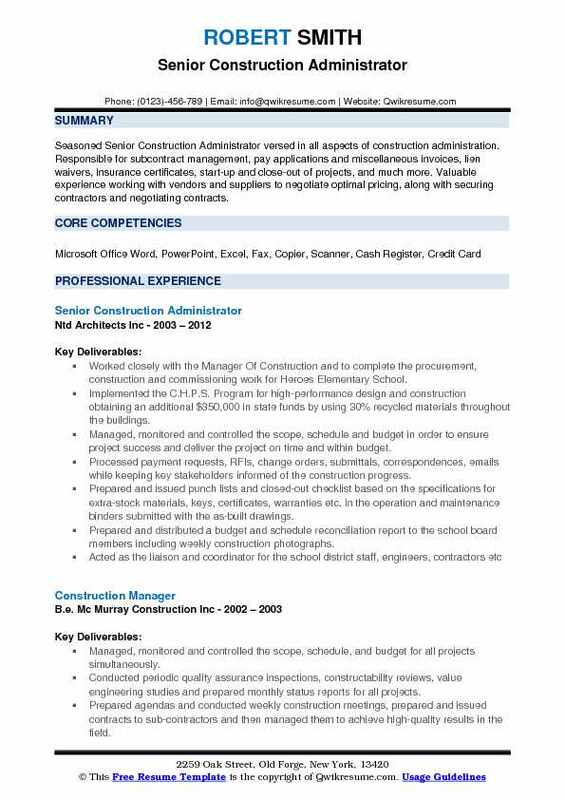 Objective : Construction Administrator seeking to expand upon fieldwork experience. Adept at construction management in a variety of settings with the ability to meet often tight deadlines while maintaining strict quality standards. Specializes in multitasking and efficiently allocating resources. Proven interpersonal communication skills providing customer service, the ability to establish strong working relationships with internal and external partners. Provided assistance and support to the Project Manager, Architects, Engineers, and Client in managing and coordinating the construction process for a special classified project at the presidential level. Liaisoned between the contractors on site and our project team and client. Coordinated daily activities for onsite work, site visits and site meetings between contractors, sub-contractors, architects and engineers and the client. Generated summaries and reports for the project team, contractors, subcontractors, and the client to ensure we meet deadlines and schedules and to keep team members informed regarding the progress of construction. Generated summaries and reports by observing work in progress, field observations, and photos which are shared with the project team in weekly team meetings. Generated, tracked, maintained and managed the construction contracts and classified documents. Coordinated and managed the editing and revising of construction contract documents. Provided assistance to the Project Manager and project team of Architects and Engineers to help ensure that contracts were complete and filed on time. Summary : Construction Administrator II with more than 17 yrs. 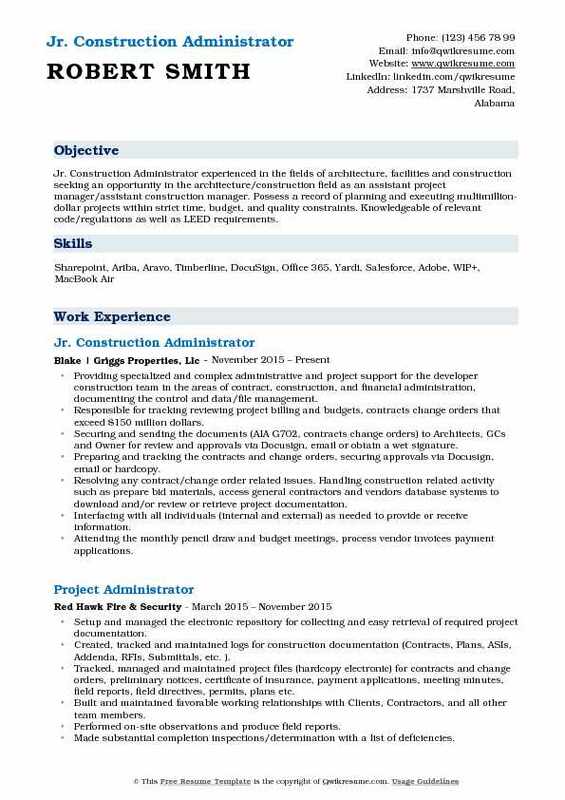 experience in administrative services. Experience includes document management, quality control reporting, data entry and assimilation processing. Coordinates the activities of Project Architect, Engineers, support staff, Owner, Contractor and all authorities having jurisdiction over the project. Excellent practical and cost-conscious problem-solving skills. Providing construction administrative services for the company under the direct supervision of the Construction Administration Studio Director. Liaisoning between the Contractor, Architect, and Client during the construction phase. Participating with the Design Project Manager and Design Project Architect during construction services, and procurement phase activities. Consulting with Design Project Manager and Design Project Architect, and Owner for decisions regarding design and program intent, as established by the construction contract documents. Coordinating the construction administration activities of design consultants. Enforcing/safeguarding/upholding the overall project design intent as established by the construction contract documents. Preparing and filing the written and oral communications for multiple projects. Reviewing the contractor submittals (shop drawings, product data, and samples). Transcribing and recording various field modifications to design for use on future projects. 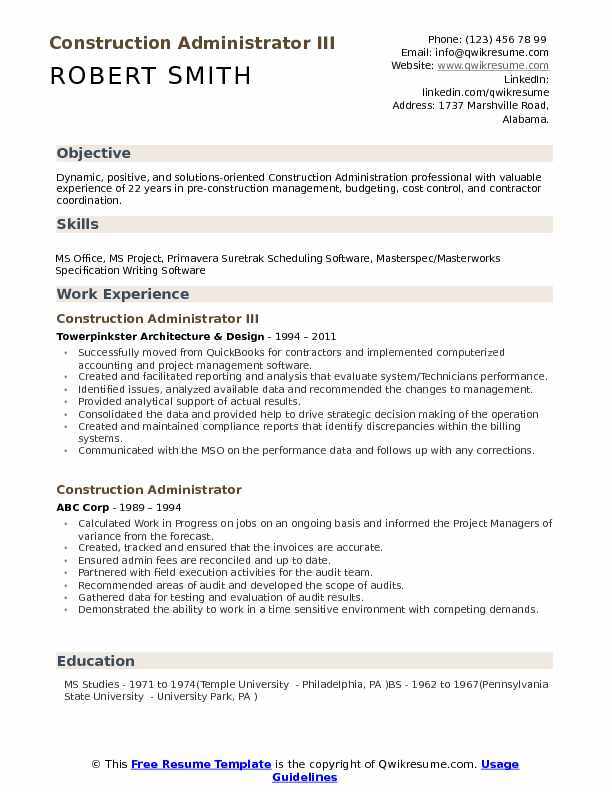 Summary : Multifaceted, award-winning and adaptable Construction Administrator with 24 plus years of experience. Well versed in building materials, building systems, building structures, building codes and standards with a working knowledge of HVAC, electrical and plumbing systems. Accomplished in all phases of project development from programming and planning through final project close-out. Managing the residential construction administration operations for a custom homebuilder, from the contract negotiations to final closing. Researching the building site location, interfacing with the funding bank to obtain draws, procure building permits, property surveys and architectural drawings. Completing the accounting functions, including job costing analysis to clients. Ensure compliance to government and industry regulations. Evaluating the cost-related aspects of the project and administer change orders, proposed changes, construction change directives, substitutions, time delays and payment applications in accordance with contract and project requirements. Providing feedback about issues for improvements (constructability, material appropriateness, clarity, function, equipment coordination, etc.) to design/production team as well as quality management and specifications teams. Setting up P.O’s & Account payable approvals (for their projects. Setting up Credit Applications with Accounts Payable on all new vendor accounts.